With tape storage still playing a role for such use cases as offline protection from ransomware, what are some key improvements in the media technology? About a decade ago, magnetic tape storage for backup started falling out of fashion. Disk-based backups became all the rage because of their ability to provide continuous data protection and, eventually, instant recovery for virtual machines. Even so, tape never completely went away, and in recent years, there has been a renewed interest in the medium. This is largely because magnetic tape storage can store data offline, where it is protected from ransomware. Even so, incorporating tape into your data protection strategy does not necessarily mean having to go back to using outdated technology. Tape has continued to evolve and remains a viable option, even in today's world. Here are three major improvements in recent years. The most obvious advancement in magnetic tape storage technology is capacity increases. LTO-8 (Linear Tape-Open), which was introduced at the end of 2017, has a raw data capacity of 12 TB per tape. 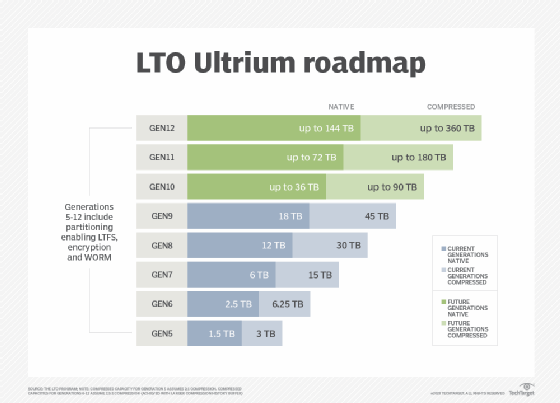 Specifications already exist for LTO-9 through LTO-12, which will further increase uncompressed capacities all the way up to 192 TB. Tapes are also a good choice for organizations that need to ensure the security and integrity of their data backups. As previously noted, tapes can be stored offline, thus preventing ransomware from being able to attack backups. However, there are other security advantages. Tape encryption has been supported since the release of the LTO-4 standard. Perhaps more importantly, LTO-3 brought us the ability to treat tapes as write-once, read-many media. Collectively, an organization can use these capabilities to ensure that a tape cannot be overwritten and that an unauthorized person cannot read its contents. Another advancement in magnetic tape storage is the use of partitioning, which was first introduced in the LTO-5 standard. The idea was that a tape could be divided into two partitions: one to store the tape's index and the other to store the actual data. This made it possible for a backup application to go directly to the spot on the tape containing the needed data rather than having to search the entire tape, as was done in the past. This approach dramatically improved performance. Since that time, tapes have begun to support additional partitions. LTO-6 and above support up to four partitions. This enables a tape to behave similarly to a disk. Administrators can drag and drop data from the file system to a tape as effortlessly as if they were copying the data to a disk. How could tape storage systems become more useful for backup?